Demonstrating K of C support for its parishes, Council 1504 assisted Our Lady of Fatima Parish with a $1,000 donation. The contribution will go toward to help fund badly needed renovations to the Church. With Parishioners in attendance, the cheque was presented to Father Octavio Cidadao, and Associate Pastor Jose Moreira following Monday evening Mass October 31, 2016. 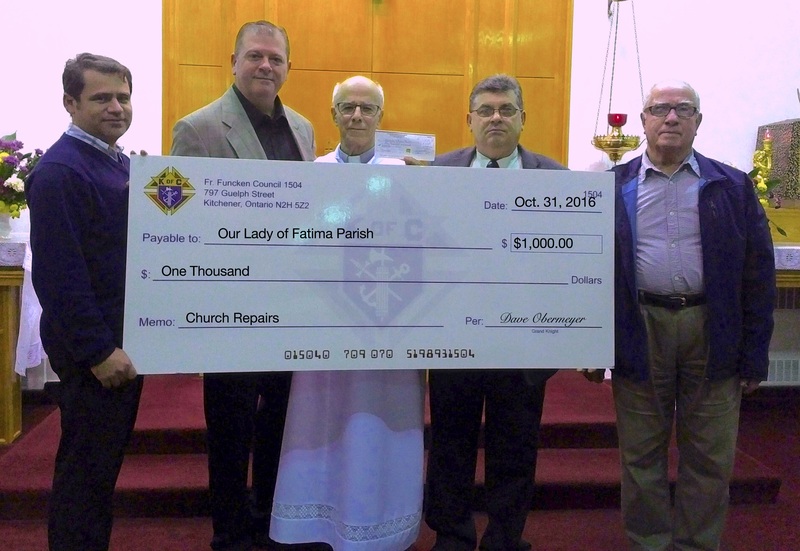 Council 1504 assisted Our Lady of Fatima Church with its renovations with a $1,000 donation. (L to R) Associate Pastor Jose Moreira, GK Dave Obermeyer, Pastor Father Octavio Cidadao, DGK Mike Szabo, Brother and Sir Knight Fernando Melo.